Explore New York restaurant Balthazar and everything that makes it iconic in this brilliantly revealing book that celebrates the brasserie’s twentieth anniversary. Keith McNally, star restauranteur, gave author Reggie Nadelson unprecedented access to his legendary Soho brasserie, its staff, the archives, and the kitchens. Journalist Nadelson, who has covered restaurants and food for decades on both sides of the Atlantic, recounts the history of the French brasserie and how Keith McNally reinvented the concept for New York City. At Balthazar is an irresistible, mouthwatering narrative, driven by the drama of a restaurant that serves half a million meals a year, employs over two hundred people, and has operated on a twenty-four hour cycle for twenty years. Upstairs and down, good times and bad, Nadelson explores the intricacies of the restaurant’s every aspect, interviewing the chef, waiters, bartenders, dishwashers—the human element of the beautifully oiled machine. With evocative color photographs by Peter Nelson, sixteen new recipes from Balthazar Executive Chef Shane McBride and head bakers Paula Oland and Mark Tasker, At Balthazar voluptuously celebrates an amazing institution. Reggie Nadelson lives in New York and has written for Travel & Leisure, Vogue, and Conde Nast Traveller. She has had columns at The Guardian, The Financial Times, and Departures, where she wrote a series about cooking with the great chefs, such as Heston Blumenthal and Ruthie Rogers. Her Departures piece about fish in Hawaii was a finalist for the MFK Fisher Prize at the James Beard Awards. Her series of mysteries have been published in a dozen countries, and her nonfiction book, Comrade Rockstar was made into a documentary by the BBC and bought by Tom Hanks for a feature film. Find out more from ReggieNadelson.com. "This book captures everything I love about restaurants—the theatre of it, the sense of entering a private little world, the camaraderie of the workers when it's all working right. There's never been a restaurant like Balthazar and never a book just like this." "At Balthazar is a beautiful New York love story. Nobody could have written it better than Reggie Nadelson who captures the tastes and smells, the glamour, nitty-gritty, and the theater of the restaurant and of the city itself." "A warm and entertaining account of one of New York City's (and my!) most beloved restaurants. Nadelson's love letter to Balthazar takes you behind the kitchen door and will make any reader feel like a restaurant regular. A must read!" 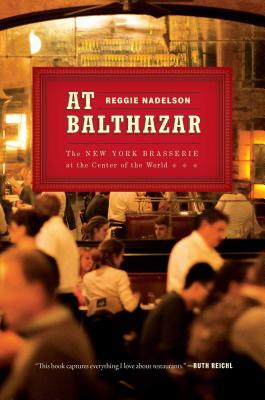 "Reggie Nadelson captures the spirit of Balthazar that has made it a New York institution. She explores its past through present, diving into the belly of the kitchen and exploring what makes this place so brilliant. If you haven't had the pleasure of dining at Balthazar yet, after reading this, it'll be on your bucket list." "Reggie Nadelson’s At Balthazar brings the place to colorful, quirky life — and in the process pays homage to the life-affirming qualities of every place we pay to be fed... In Nadelson’s deft hands, the restaurant becomes a metaphor for the city’s ceaseless cycles of ambition, immigration and change." "Reggie Nadelson finds brasserie bliss."